Prepare your crayons. Sharpen your colored pencils to a fine point. A Labyrinth coloring book is coming, and you'll only have 13 hours to complete each and every page, or else. Just kidding! 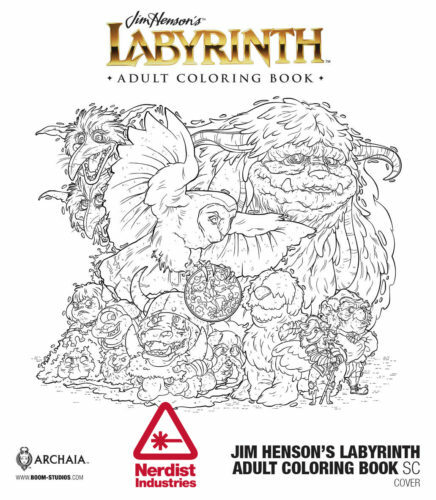 You can take your time lovingly filling in every strand of the Goblin King's hair in the upcoming Jim Henson's Labyrinth Adult Coloring Book from BOOM! Studios. We're excited to share an exclusive look at pages from the Labyrinth coloring book, as well as art from the Cursed Pirate Girl Adult Coloring Book. With art by Philip Murphy, Jay Fosgitt, and Jorge Corona, the coloring book will feature characters such as Jareth, Sarah, Ludo, Hoggle, and more in its 40-plus black-and-white illustrations. You'll be able to pick up the 96-page softcover book in October 2017 from comic shops and bookstores. I'm not drooling, you're drooling. The Cursed Pirate Girl Adult Coloring Book will be available in November 2017. Including art by Cursed Pirate Girl creator Jeremy A. Bastian, this 96-page softcover has over 50 black-and-white images for you to develop. Bastian is known for his incredibly intricate and detailed art, which makes for the best kind of pictures to color, in my opinion. You'll even be able to add dialogue to the book since some of the illustrations have empty word balloons. Visit the gallery below to see interior pages from the Cursed Pirate Girl Adult Coloring Book. How many coloring books, adult or otherwise, do you own? Tell us in the comments or at Twitter--@nerdist and @amy_geek--and feel free to share pictures of your work. The soundtrack is getting a vinyl reissue! A sequel is in the works with Fede Alvarez and Jay Basu (Don't Breathe) attached. Brian Henson reflects on Labyrinth's 30th anniversary and his father's legacy.